Here's the second part of our mini river fly fishing series Trout Fishing The Head Of A Pool. It will provide you with all the information and tips you will need to ensure you are successful the next time you tackle a trout river. If you haven't read part one of this mini series, click HERE. Polariods are often marketed for their exceptional fish-spotting capabilities as well as protection against wayward casts. Polariods reduce glare, allowing us a more privileged view beneath the surface to identify potential underwater lies, like boulders and perhaps darker areas that indicate deeper areas or channels that may house several fish. They are especially useful in the rough water at the head of the pool, which would normally be inpenetrable. As the river widens and the current becomes more even, Spiders and wet-flies presented either upstream or across-and-down (depending on prevailing conditions) become a more viable option. When you have a fish on what should you do to avoid spooking others? To some degree, it all depends on individual fish. Sometimes other trout (including large ones) will continue feeding despite one of their kind crashing about the pool, but I’ve also witnessed others stop feeding for a while and, in extreme cases, altogether. Generally, though, hooked fish should be quickly steered away from your intended fishing area. Try angling the rod sideways to coax them in a given direction. It can be worth retreating to net the fish, before resting the area for a while. Just because you can’t see fish, it doesn’t mean they’re not there. In all but the most perfect conditions of illuminating sunlight and clear water, fish may be difficult to spot. Even in perfect light they can be masters of camouflage. Add broken surface water and suddenly the ideal of locating fish by sight becomes a non-starter. For this reason you should fish “blind”. Divide the run into bite-sized sections and cover them effectively. In essence, we are using search tactics here, while scrutinising the surface for a rise or for any place a fish may choose to lie. Elk Hair Caddis and Pheasant Tail nymph. The generous wing of the Caddis makes it float well and hence support the nymph in this dry-fly/nymph New Zealand-style combination, which is ideal for searching rapids. The best way to tackle these channels is with two small nymphs or perhaps the popular New Zealand (duo) style (where a small nymph is suspended on a short length of mono tied to the hook bend of a dry-fly). Obvious fly combinations to try include an Elk Hair Caddis/beaded Pheasant Tail nymph or a Klinkhamer/Biot nymph. Whatever method you choose, casting upstream is usually most successful because the channels are often too narrow to consider across-and-down tactics. Besides, there’s a risk that the trout may notice you wading down to them. As the water flattens out and widens you must making vital changes to your leader. Here, the pace of the river is slower and the fish will have more time to see your fly, making presentation more critical. In this area a leader of 12-14 ft might sound long but it is necessary to eliminate drag on the fly. What if there is more than one fish? Whether it is two, or ten in a shoal, fish feeding close together always present a dilemma of which one to target first. 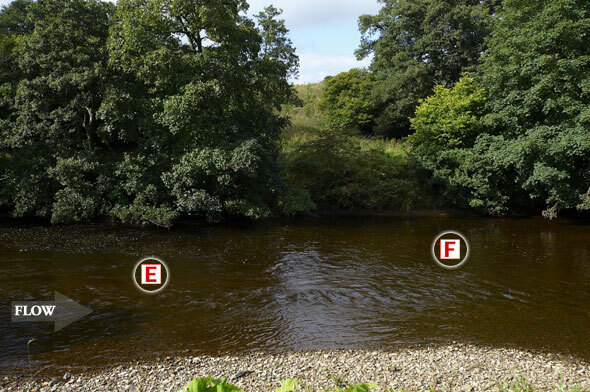 If you’re working upstream, it’s best to concentrate on the rear markers with a view to guiding them away once hooked. Casting over fish to reach a larger specimen often means your fly-line spooks potential takers. Alarmed, these fish usually bolt, which in turn warns others that danger is pending. Obviously, if you are fishing downstream the upstream fish should be cast to first. Short-line nymphing (Czech style) can be employed with confidence in areas of greater depth. Although it’s a method that has been “done to death”, it has merit in adverse conditions of cold or flood. And there are days when trout and grayling remain hard on the riverbed and to catch them it’s necessary to drift a bug past their noses. As with Spider fishing, an upstream approach is best tried in clear or low water to avoid spooking fish. In this case two flies is far less alarming to fish than the normal “mandatory” team of three. Where flows quicken, or a spate is in progress, fall back to three flies. Nymphs I might use include a Caseless Caddis and the beadhead Czech Nymph – whether gaudy or drab, nymphs for fast water should be heavily weighted and compact. Although tempting, it’s wise to ease off the peddle a little when you arrive at the water’s edge. Time spent watching is time rarely wasted. Staying well back, position yourself so that you have a commanding view of the pool head, keeping one eye on the water as you tackle up. When it comes to making your move, having slipped down the bank, assess the water one more time. It’s curious how a pool betrays more seams, currents and feeding lanes from a different angle. Afraid of alerting fish, I’m a stickler for not using studs in wading boots. And while felt soles do offer superior grip, some may feel more confident with additional studs. In this case, select soles with studs in the heels only. Faced with strong currents, you can then dig in with the heels. As for sneaking up on fish in skinny water, tip-toeing should prevent you sounding like a drill sergeant on a route march. In deeper, flat water where there is less surface cover for the fish, more careful wading and nimble footwork is required to get you within range of your target without spooking it. Fish hooked in strong currents often use the flow to their advantage by bolting downstream. Rather than “hand-lining” (playing the fish by pulling line through your fingers), it’s as well to get line back on to the reel. Otherwise, any retrieved slack unravels downstream of you to create a hazard in which your prize can tangle, creating all kinds of problems. 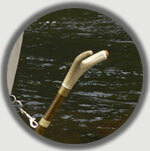 Offering stability, wading sticks are needed for many situations, not least crossing rivers, or testing the depth. However, steer clear of those with metal tips. Clattering about on the riverbed they serve only as an alarm bell to nearby fish. Instead, select one with a rubber button to cushion sound. Collapsible types can be stored in a holster/sheath when not in use, eliminating noise completely. Click here to go back to the first part of Trout Fishing the Head of a Pool.